Tapas in Málaga has been shortlisted for the Luxury Travel Guide Awards 2016 in the “Holiday and Tour Specialist Awards”! We are highly honoured to be shortlisted for such a prestigious award. The Luxury Travel Guide announced the news to us yesterday. “The Luxury Travel Guide are pleased to announce TapasinMalaga has been nominated as a potential winner in the 2016 Holiday & Tour Specialist Awards. Over the past 12 months we have been receiving votes for individuals & companies throughout Europe, with our subscribers, hotel guests, travel agencies and industry experts all voting on who they feel is most deserving. Thank you to everyone who has recommended us. 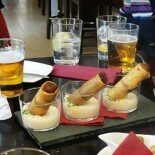 This entry was posted on January 16, 2016 by Tapas in Malaga in Awards, Cityreak destination, Málaga, Tapas, Uncategorized and tagged Andalucia, Gourmet Spain, Gourmet Weekends in Malaga, Guided Tours in Malaga, Malaga Shore Excursions, Malaga Shore Excusrions, Málaga, Spain, Tapas, Things to do in Malaga.